Contractors have pulled construction permits for twin apartment towers and filed to build a Costco at SoleMia in North Miami. The apartment permit was issued on April 21. According to the permit, twin 17-story towers and a 5-story parking garage are being built. Total value of the apartment job is estimated at $91 million. There will be a total of 759,250 square feet, with 397 apartments. The Costco is valued at $85 million, according to the SFBJ. The construction permit for the store was filed on April 21. 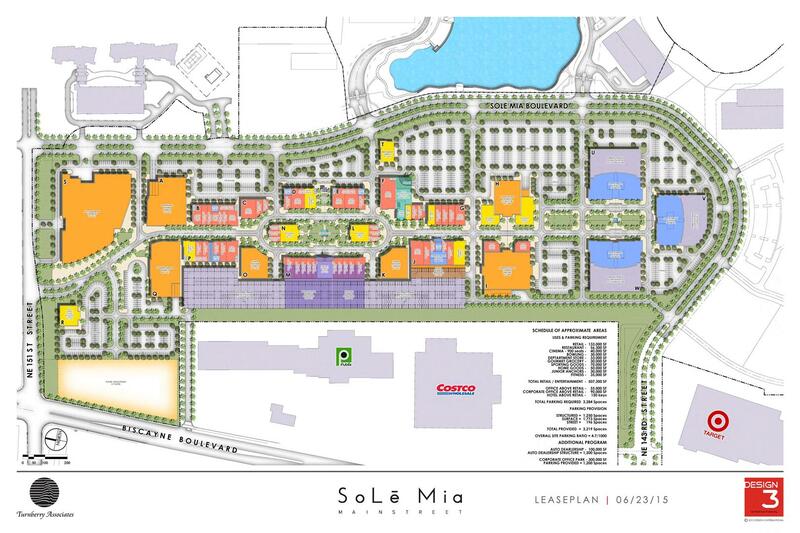 SoleMia will also include a car dealership, high-end cinema, and gourmet grocery. Eventually it could also include 4,390 residential units. Isn’t solemia right next to a Costco already? This is the same one in Aventura right? yeah I’m not too sure I get what’s going on here?. Costco owns the land where the current store is. Most likely they got offered to purchase the land to create a 3rd main entryway into the project, and a long term lease in exchange for land. The Tires plus on the Outparcel has had some foreclosure issues from what I recall, so they may have already purchased the note on that as well. Costco is probably building a new store.. they recently moved the one in Doral a short distance as well.